(Breitbart) The report, which cites thousands of peer-reviewed articles the United Nations-sponsored panel on climate change ignored, also found that “no empirical evidence exists to substantiate the claim that 2:°C of warming presents a threat to planetary ecologies or environments” and no convincing case can be made that “a warming will be more economically costly than an equivalent cooling.” The U.N.’s panel is scheduled to release its next report next month. The report blows away the Warmist hysteria regarding sea rise, temperature rise, melting glaciers, “extreme” weather, the Arctic, and every other bit of doom and gloom. I’d highly recommend reading at least the Summary For Policymakers. The study focuses on actual observable data, rather than computer models, micro-reconstructions, and “normalized” data. Nor does it completely dismiss what Mankind does, but notes that our works are miniscule in comparison to natural variability. 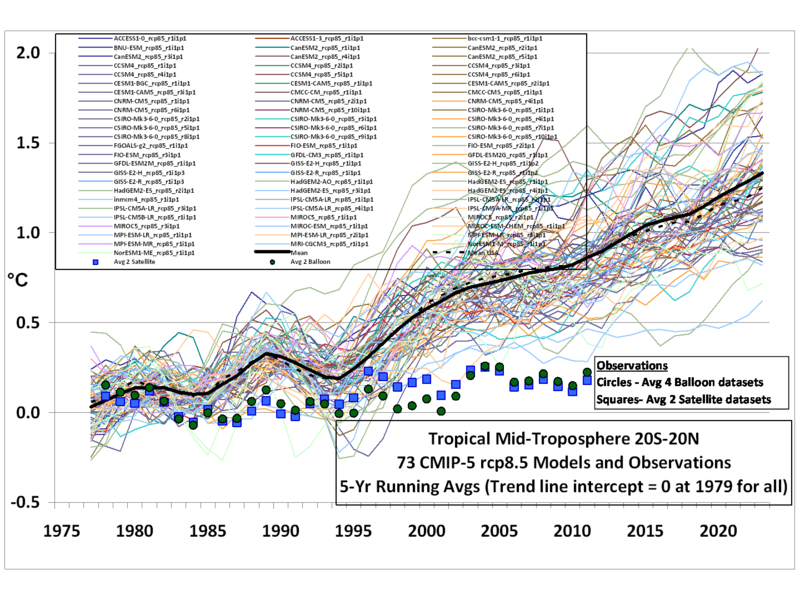 *Note: the attached graphic is not from the report, but one that has been out that highlights the difference between the Warmist computer models and real world observations.